With the BACKROAD, we present you an all-rounder that – as the name suggests – also feels at home away from tarmac roads. A longer wheelbase, wider tyres and powerful hydraulic disc brakes provide smooth running and safety on rough grounds. Yet, the BACKROAD stays true to its racing genes by offering lightness and agility. It impresses with a lightweight 1040 g carbon frame, internally routed brake hoses and gear cables, as well as with a ROSE Disc full carbon fork with thru axle that regularly scores best marks in international tests. In addition, the bike’s frame and fork feature the FlatMount standard to mount disc brake calipers. This saves weight and evenly distributes the braking load. And as no cross-country tour is like the other, the BACKROAD is available in two different versions – as a gravel bike and as a cyclocross racer. 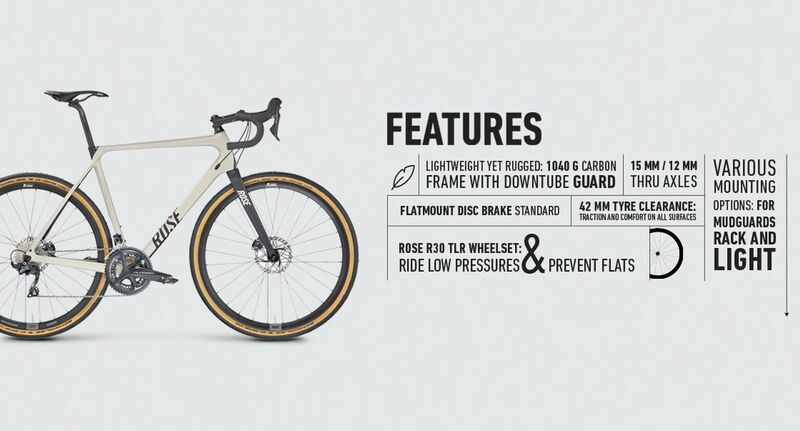 As the name suggests, a gravel bike is perfectly suited for riding on gravel and cobblestone or for tackling paved field, forest and meadow paths. It allows you to ride everywhere a classic road bike would have its difficulties. Therefore, the BACKROAD GRAVEL is the best weapon for thrill seekers looking for off-road adventures. However, when equipped with mudguards, lights and a rear rack, it is also a great choice for commuters. The biggest difference to the cyclocross model is the choice of tyres. The BACKROAD features the 38 mm wide G-ONE Allround Evo tyres by Schwalbe, impressing with extremely low rolling resistance and a classic Skin look. Another special characteristic of the gravel bike is ist compatibility with a maximum tyre width of 42 mm – for extra comfort. The combination with lightweight, robust ROSE Thirty Disc wheels promises speed and comfort on any gravel path. The ROSE RC-170 Flex carbon seat post skilfully absorbs unpleasant shocks; the Ritchey WCS Evomax bar provides freedom of forearm movement and greater leverage when in the drops. The BACKROAD is available with different groupsets. Shimano Ultegra and Ultegra Di2, SRAM Force or Shimano 105 – the choice is yours!